Joe used to think surviving in one world was tough, now he must do it in two. Joe’s dad is dead, his Mum is struggling to keep the roof over their heads, and the school bullies have decided he’s their favourite flavour. His sketchbook, and attic/ bedroom, where a modern boy still embraces the best of the 80’s, surrounded by Atari not PS3, and Transformers not Ben 10, has become his own little world - and after missing his regular insulin injections, that’s exactly what he encounters. Traversing his home in a weakened state, looking for medicinal aid, and discovering a fantasy world where his toys are losing a desperate civil war, Joe’s not the only one flipping between reality and the fantastic. 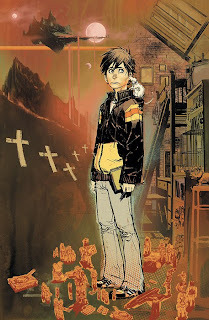 Writer Grant Morrison, whose critics often label ‘little characterisation’ and ‘confusing trains of thought’ as his professional kryptonite, spends the first three quarters of the book setting Joe and his home up. While ‘classic Morrison’ ideas hit as Joe’s journey begins, what precedes it is some of the strongest ‘slice of life’ writing I’ve read in a long while, and easily some of the writers most approachable work thus far. The power behind the throne is the artwork of penciller Sean Murphy and colourist Dave Stewart. Only one issue in and already I can’t think of anyone else who would be better suited to this story. 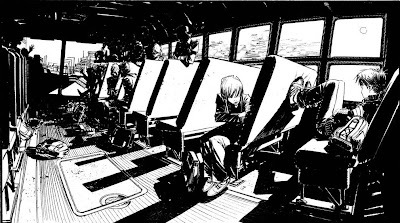 Just going B&W for a moment, for example purposes, look at this shot of Joe’s school bus – that’s the kind of all-descriptive atmosphere and detail Sean brings to every panel in the entire book. It’s not only mind-blowing stuff; it’s made me an instant fan. Readers still on the fence about whether they will pick-up the mini-series, may find the three and a bit page wordless trek from the bus stop, through the house, to Joe's room a bit hard to swallow, but knowing the book will be about a fantastical trip back through these same ‘lands’, these pages had me eyeing up every little detail, trying to guess at how they will be reinterpreted the second time around. After all Lord of the Rings is always a little easier to follow with a map of Middle-earth. Better yet, at one measly American dollar (or your national currency equivalent), this issue is cheaper than a can of coke, and with cameo appearances by toy imitations of Optimus Prime, Snake-Eyes, Batman and Robin (among others) in it’s pages, Joe The Barbarian is a perfect stepping-stone for those readers a little hesitant in stepping away from the world of 'capes and utility belts'. Sean Murphy's art certainly make this book worth a look. 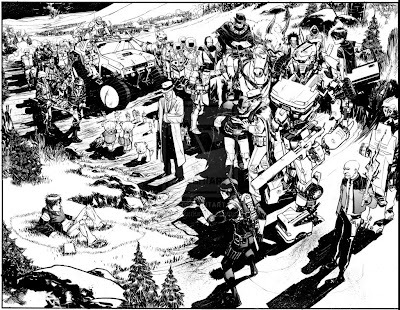 I love all the characters in the group shot with Clint Eastwood on the horse and the Star Trek guys and how they all have action figure joints. its just fun to pick through the details. there are a few more images from the book on Sean's deviant art page as well. simply stunning details in the pages, you could look at them for hours. I agree Frank - I'm still picking up new details each time I re-read issue 1 and that's not even counting the latest stuff in issue 2. Hopefully there's a lot more instore from Sean in the future!